A Moffat County Road 5 sign includes for fire restrictions as responders tackle a wildfire and burning building on CR 5 and CR 7. A wildfire along Moffat County Road 7 sprung up Friday afternoon, with at least one structure catching ablaze as well. Responders were called to the scene about 2 p.m. about 25 miles north of Craig on County Road 7 and CR 5. 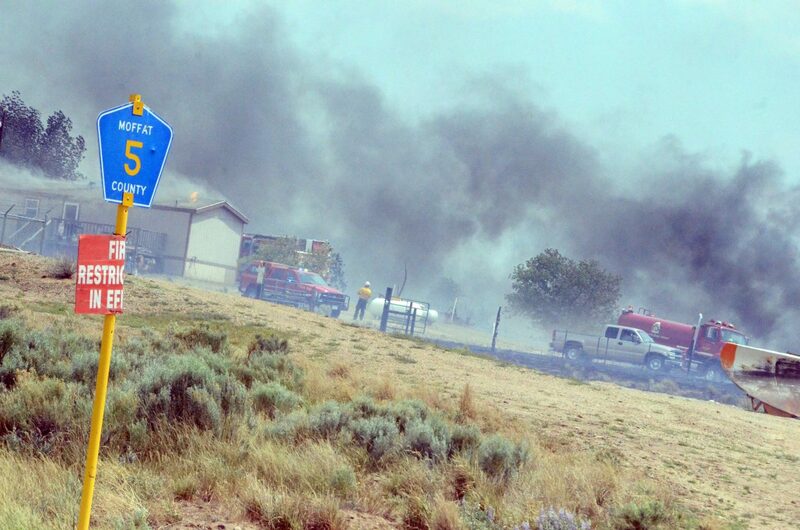 A building on CR 5 was affected by the flames that burned through grass and sagebrush. Authorities did not have details about the cause or size of the fire, and it is not yet known the extent of the damage to structures or if there are any injuries involved. Crews have worked to prevent the spread of the fire around the Great Divide area, with winds contributing to it. Among the agencies on scene were Moffat County Sheriff’s Office, Craig Fire/Rescue, Memorial Regional Health Emergency Medical Services and Colorado Department of Transportation. Air support is also expected. A Facebook update at 7:30 p.m. from Yampa Valley Electric Association noted that personnel have also responded with the possibility of needing to de-energize power lines. By 9 p.m., fire crews were also called farther south on CR 7 due to flames near the road’s intersection with CR 17.